In extended conflicts, “bullets and bombs are not always the deadliest threats to a child’s life,” a new UNICEF report reveals. During such conflicts, children are up to 20 times more likely to die from diarrhoea than violence. As is evidenced by recent outbreaks of cholera in Yemen and Mozambique, conflict and disaster-resilient water, sanitation and hygiene systems can be a matter of life and death. UNICEF released its new report, Water under Fire, last week, which focuses on the health impacts that lack of safe drinking water, sanitation and hygiene (WASH) have on children due to waterborne disease risks – particularly during conflicts, like the one happening in Yemen. 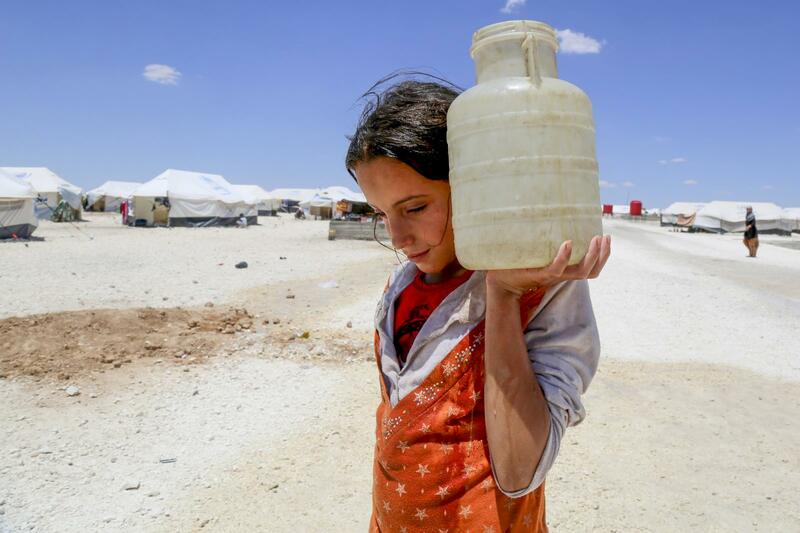 Horriya, 12, carries a jerrycan of water in a makeshift camp near Raqqa in the Syrian Arab Republic. These same health impacts often follow natural disasters and other humanitarian emergencies, notes the report, which was issued just as concerns rose over a cholera outbreak in Mozambique after the devastation wreaked by Cyclone Idai to the water supply system, with heaviest damage in the port city of Beira. More fundamentally, the risks of waterborne disease are rooted in the underdevelopment of WASH infrastructure throughout much of the developing world – where diarrhoeal disease remains one of the largest killers of children under five, the report highlights. To address this, the report sets forth a change agenda to stop attacks on WASH infrastructure and personnel; build a WASH sector that is resilient to conflict and disaster-related emergencies; and connect humanitarian responses with the development of sustainable WASH systems that ensure the right to safe drinking water and sanitation, even during emergencies. Since January “nearly 109 000 cases of severe acute watery diarrhoea and suspected cholera were reported with 190 total associated deaths,” the WHO said, noting that children under five make up nearly a third of the cases. In Mozambique, following the devastation by Cyclone Idai to the water supply system in the port city Beira, many people have no access to clean drinking water, which has resulted in the emergence and spread of the water-borne disease cholera, according to a Doctors Without Borders/Médecins Sans Frontières (MSF) news release. Some people “have no option but to drink from contaminated wells,” and some “are even resorting to drinking stagnant water by the side of the road,” Gert Verdonck, MSF’s emergency coordinator in Beira, said in the release. The UNICEF report highlights the severe impact that lack of WASH services has on children, who are the most vulnerable to water-borne diarrhoeal diseases. 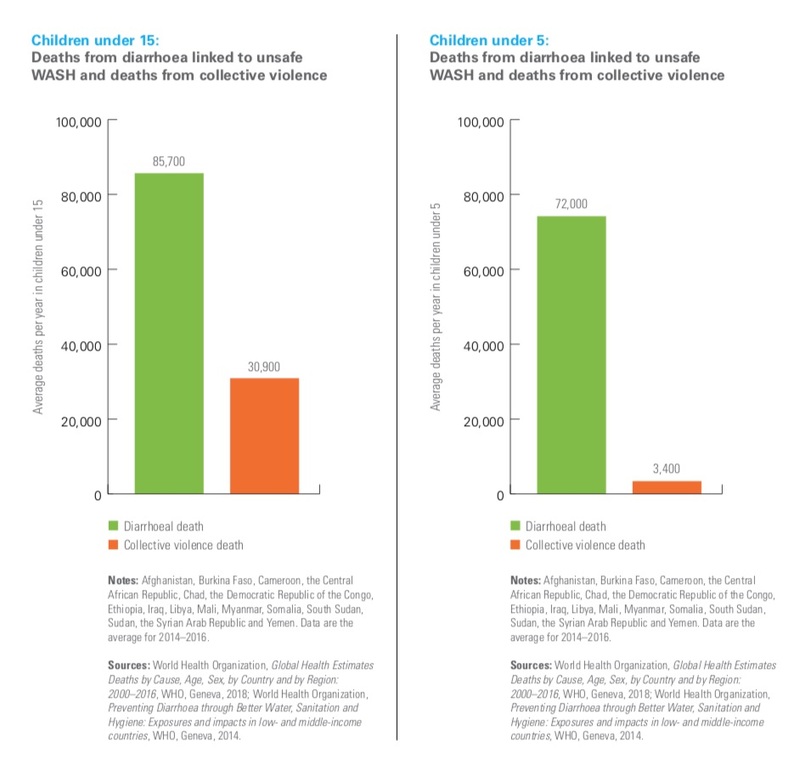 It finds that during deep and extended conflicts, which last on average for 9 years, children under 15 years are three times more likely to die from diarrhoeal disease than violence, while children under five years are 20 times more likely to die from diarrhoeal disease than violence. “Globally, an estimated 2 billion people live in fragile and conflict-affected areas. The report finds that WASH-related humanitarian emergencies commonly occur in countries that already have underdeveloped water, sanitation and power systems, and that already struggle to meet the targets set in the Sustainable Development Goals. “In these countries, when emergency strikes, the WASH and power systems are not resilient enough to handle the shock,” it says. In the report, UNICEF puts forth a change agenda that is based on the right to safe drinking water and sanitation, as reflected in the United Nations Convention on the Rights of the Child. “Link life-saving humanitarian responses to the development of sustainable water and sanitation systems for all,” while ensuring that WASH systems are prevented from deterioration and collapse during crises.